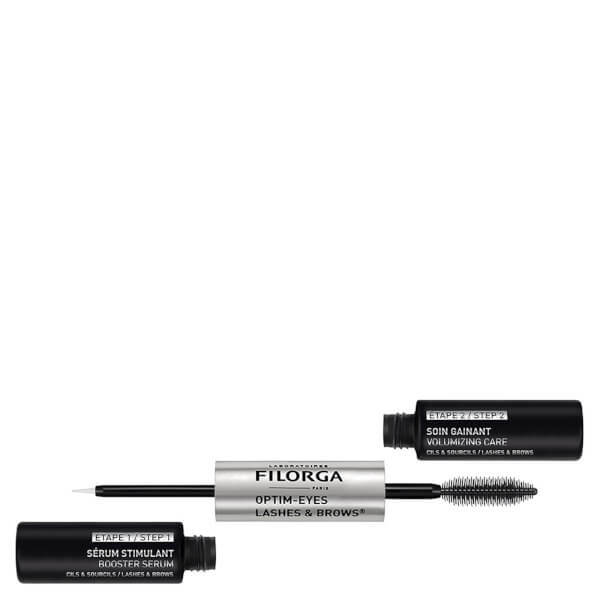 Define and protect eyelashes and eyebrows with Filorga Optim-Eyes Lashes & Brows, a double-ended wand that contains a nourishing formula to hydrate, condition and volumise. At one end of the essential tool lies an ultra-thin brush that can lay down product precisely at the hair roots. A combination of KERA-EXTEND CX® complex and NCTF® work to protect fragile hairs, reducing breakage and falling out, and lengthening individual strands for fuller-looking lashes and brows. At the opposite end of the wand is a mascara brush that is shaped specially to coat each individual hair in conditioning serum. A double action nutrition matrix infuses the lashes and brows with proteins, encouraging growth and volume. The colourless formula also ensures makeup has improved staying power. The result is thicker, fuller lashes and brows that are visibly healthier. Apply the serum to the roots of cleansed lashes and brows in the morning and evening. The applicator brush delivers the product optimally and precisely. Apply the product to the brows and lashes from root to tip in the morning and evening. The brush coats each lash and brow with powerful active ingredients to nourish. Lashes and brows are cared for and perfectly prepared for makeup application. Ingredients 2: Aqua (Water), Butylene Glycol, Propanediol, Pvp, Glycerin, Bambusa Arundinacea Stem Powder, Pentylene Glycol, 1,2-Hexanediol, Phenoxyethanol, Disodium Edta, Zea Mays (Corn) Starch, Ceratonia Siliqua (Carob) Seed Extract, Hydrolyzed Soy Protein, Polyquaternium-16, Sodium Hydroxide, Panthenol, Plankton Extract, Potassium Sorbate, Sodium Benzoate, Guar Hydroxypropyltrimonium Chloride, Biotinoyl Tripeptide-1, Polyquaternium-7.